In Hindu ceremonies, turmeric is considered extremely auspicious for rituals - it marks a good beginning because of its medicinal properties. It is a great antiseptic and, when eaten, helps in digestion and is good for the skin and bones too. Almost all Hindu rituals have a role for turmeric in them. Among the spectrum of holy plants and spices, haldi ranks high! Turmeric is extremely good for the skin and several skin care products have turmeric as a basic ingredient. The ubtan is a mixture of some of the most effective skin-rejuvenating ingredients, such as sandalwood, curd, gram flour and so on along with haldi. The haldi ceremony therefore ensures that the bride and groom shine through the wedding with glowing, fresh skin. One might say that the ceremony is held as a home spa and beautification routine for the soon to be newlyweds! Of course, most brides and grooms are a little nervous and anxious right before the ceremony. Massaging the ubtan onto the skin relaxes the body and takes their mind off the tension. In addition, turmeric has an antioxidant called curcumin that can act as a mild counter to depression and anxiety. See? Our forefathers/mothers knew all about wedding jitters and had it all figured out! Turmeric is prescribed as a detoxifying agent. The application of turmeric onto the body acts as a cleanser and purifier - both literally and symbolically. As the bride and groom step into a new life, the haldi ceremony is supposed to act as a detoxifying massage. The bath afterward is meant to purify them. In many communities, the bride and groom are kept away and discouraged from meeting each other and even others until the actual wedding ceremony begins (a tradition dying down, thankfully!). Remember when Chris Martin sang, “They were all yellow!”? Well, yellow is indeed associated with happiness, spring and new beginnings. In Hindu weddings, after red, yellow is considered to be a very auspicious colour. The haldi ceremony requires the bride and groom to wear yellow to invite peace and prosperity. In fact, in many communities the bride and groom wear yellow during the actual wedding ceremony as well! Lastly, the participants of haldi ubtan give their blessings to the future newlyweds as they help them get ready for the ceremony. The ceremony itself is meant to prepare the bride and groom for the big event. It is also meant to help them relax. The family members come together to help them slowly start gearing up for the wedding itself. GIFs: Tumblr, Giphy HAVE A STORY IDEA FOR POPxo? If you want to hear about it, we can write about it! Just tell us your idea here! 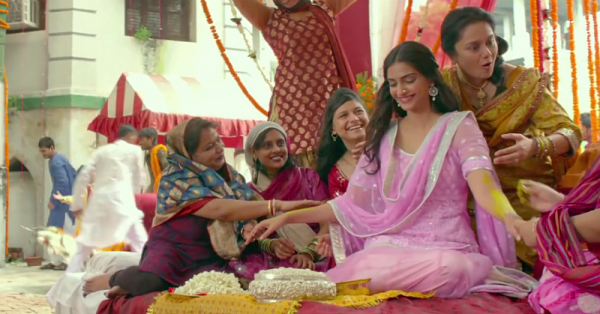 MUST-READ: 5 Little Wedding Rituals That Always Make A Bride Feel Special! MUST-READ: 6 Homemade Face Packs To Get That Bridal Glow In Minutes!